Sometimes certain actors get associate with one particular role, and that's true of Marvel superstar Chris Evans. He'll never be separated from his Captain America persona. Not after playing the character in three standalone movies, and three Avengers team-up movies. But most actors, if they're good, are nothing at all like their characters. And Robert Downey Jr. has set out to prove that in the simplest of ways. RDJ hit his social media accounts this week with a cheeky little post, showing the differences between Chris Evans and Steve Rogers. And he's right on the money. At least from what we've seen and heard from Evans in the press. After seeing this quick assessment of the man separated from his art, Chris Evans had one simple word. Robert Downey Jr. shows Steve Rogers as the stern, stoic hero who comes to the rescue to save the day from Thanos. Even though the true American icon fails in his quest, even after recruiting Black Panther and the whole Wakanda army to join at his side. RDJ then shows Chris Evans as a smiling goof who looks like he's ready for a wild party. It's quite the battle of the Ids, and there's no mistaking the two now. Chris Evans has been having a lot of fun on social media lately. This past week, he really went after Trump, to trash the President's grammar skills after he misspelled the word 'counsel'. It didn't end there. The actor continually taunted our Commander in Chief by calling him Biff, in reference to the bully in Back to the Future who steals a sports almanac and takes over Hill Valley. A bit of trivia, the Future Biff we see in Back to the Future 2 is based on 80s era Donald Trump. 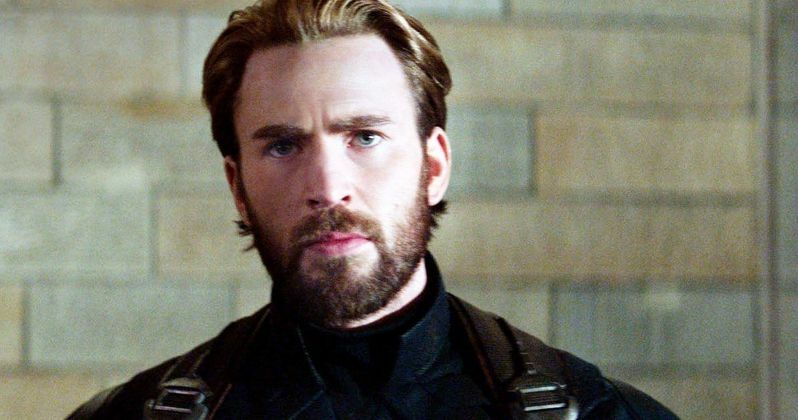 Fans were disappointed that Chris Evans got limited screen time as Captain America in Infinity War. The Russo Bros. have already promised that he'll have a heavy presence in Avengers 4. The hero had been separated from the Avengers team ever since Captain America: Civil War. And we don't get to see him reunite with Robert Downey Jr.'s Iron Man in Infinity War. That will all change, when these two old friends turned enemies reunite in Avengers 4. It's heavily speculated that both Iron Man and Captain America will die in this next sequel, which will bring Marvel Phase 3 to a close. It's suspected that both Chris Evans and RDJ's Marvel contracts are at an end. And this will be the last time we get to see the two together on screen. But if history serves correct, Chris Evans will probably keep that big goofy grin on his face the entire time he's promoting the movie. You can check out the pair's twitter updates here.